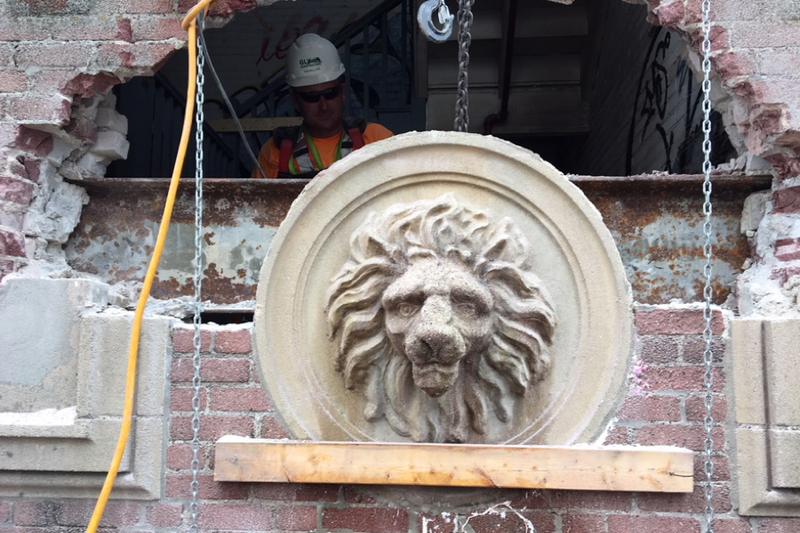 For nearly a century, a concrete lion’s head has kept watch over Gilman Square in Somerville. Placed there when the brick, art deco-style Homans Building was built in 1929, the fixture has sat undisturbed as the structure changed hands through the decades. It might have been an historic centerpiece of a revitalized version of the building, had a renovation plan pitched after the city bought it in 1999 gone through. But instead, it has just stayed there, guarding the giant space as it morphed into a storage facility for city office supplies, and then an abandoned, graffiti-splattered husk along the train tracks. The lion might have come to an explosive end. As prep work for the long-awaited Green Line Extension makes its way through Somerville, the Homans Building is slated to be demolished in a few weeks. In its place, construction crews will set up a staging area for the GLX project, and eventually, the area will welcome Gilman Square station, one of six new Green Line stops. But the city sought to save it from that fate. 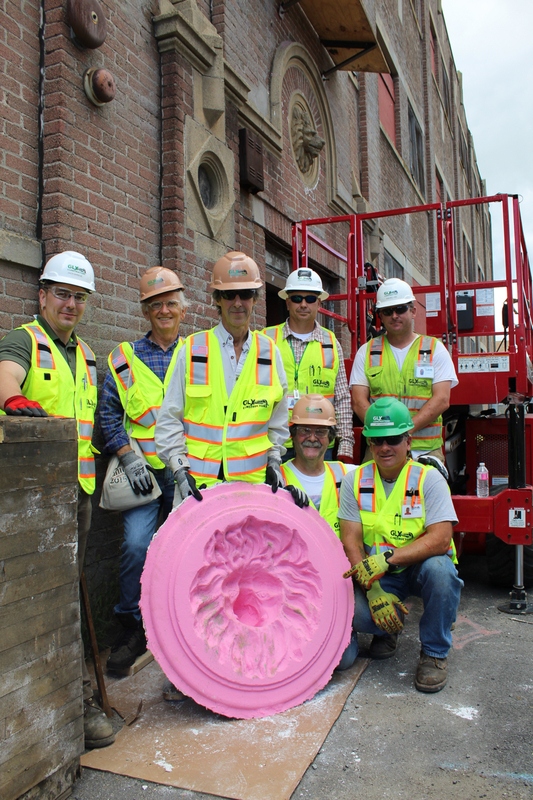 With oversight from Somerville’s Historic Preservation Commission, the MBTA this week got to work rescuing the lion’s head from its perch. Work began on Tuesday. As a precaution, experts from a sculpture company in Woburn called Skylight Studios were called in to make a silicone mold of the beast. They smeared pink putty over its rough, gray face to capture its unique features, in case it cracked or crumbled in the process and a duplicate needed to be made. Then workers from local masonry company began painstakingly chipping away at the molding around the circular sculpture with small chisels. 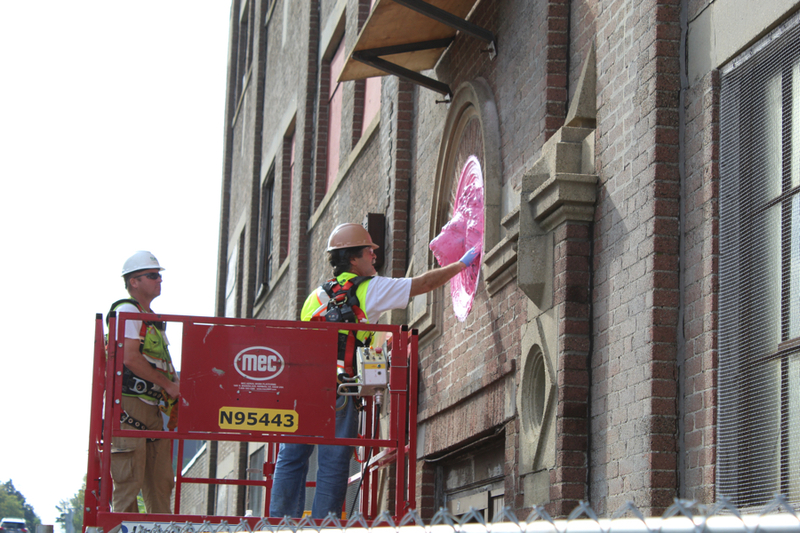 There had been an effort to save all or part of the building, as members of the historic commission worried the neighborhood would lose some of its character if the Homans Building were replaced with a big hunk of glass. But ultimately there was nothing that could be done for it, as years of neglect had left sagging, unsafe floors, and a report found that the “structural integrity of the building is severely compromised,” especially the brick facade with the lion’s head stuck in it. So the commission thought that saving the head, along with some of the other interesting cast concrete shapes near the entryway, was the right thing to do. They was first installed by Reid, Murdoch & Co., a grocer whose brand Monarch Foods has a lion for its logo. 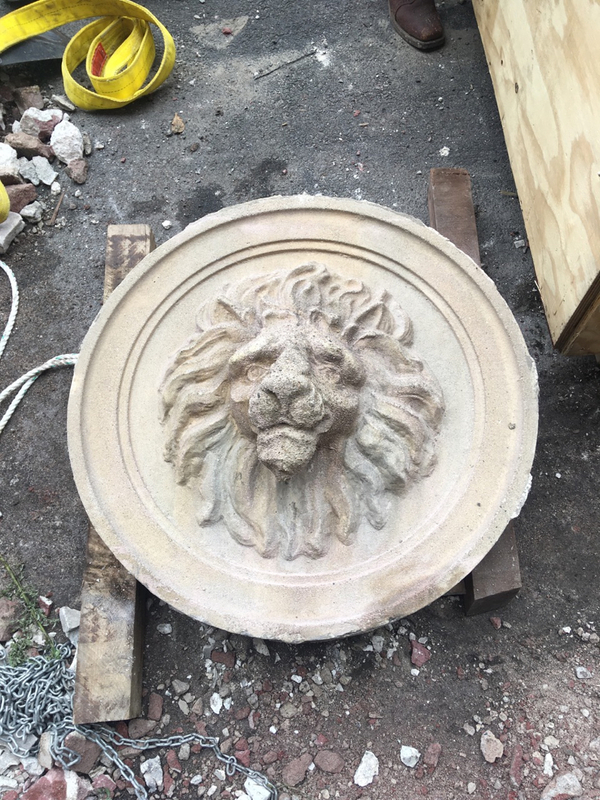 “As a symbol for the company, the lion’s head speaks to economic opportunity, it speaks to investment, and it speaks to the impact that this relatively large commercial grocer had on the Boston area,” says Sarah White, a city planner in Somerville’s Office of Strategic Planning and Community Development (the decision about the lion’s head predates her). “It’s become a symbol within the city, and I think it’s worth preserving for that purpose alone. It’s also a nice example of cast concrete,” which, she says, is not always in great shape at this stage in its life. Hence, the precautions. But the lion didn’t crack. 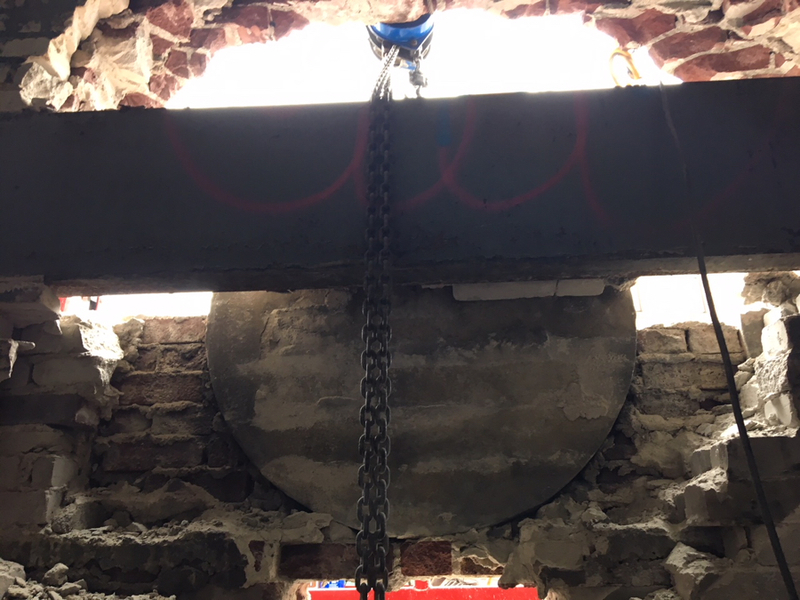 With all the bricks smashed away, and ropes tied on either side of its snout, the team lowered the sculpture to the ground with a pulley system on Wednesday, after two days of careful work. Some neighbors across the street caught it all on video. This of course won’t be the only change the GLX will bring to Somerville. Union Square is poised to see a major $1.5 billion development, property values have already skyrocketed, and a lot of the rapidly changing city will never be the same. So it’s nice to see a familiar face in Somerville won’t be lost to history.